The Northern Line is the busiest of the Tube network carrying 206 million passengers a year. Rush hour commuters are being asked to walk or cycle instead of taking trains on a London Underground line in an attempt to reduce overcrowding. Travellers are being asked to avoid getting on the Northern Line between Tooting Bec and Clapham North between 0800 GMT and 0845. Transport for London (TfL) said commuters often had to wait for two or three trains before they could board. Travellers will be given advice on alternative routes. Leaflets and information boards will be available to passengers at Tooting Bec, Balham, Clapham South, Clapham Common and Clapham North. Tooting Bec and Clapham North are a 2.5-mile (4km) walk apart. TfL says the pilot project, starting on Monday, will offer commuters similar help to that offered during the Olympics to find out if it helps to reduce overcrowding. A TfL spokesman said it wanted passengers to rethink their journeys. "For example if you get the Tube at Clapham North to Stockwell just to transfer to the Victoria Line maybe you could instead walk as it would only take 10 minutes. "Or could you start your journey 10 minutes earlier to avoid the crowds?" he said. A spokesman from website Commuting Expert said while the reality on the Tube was massive overcrowding and he understood it took time to build up extra capacity, it was frustrating for commuters. "Transport costs are going up and up while salaries stay flat so it is frustrating when the service you're paying for isn't the service you're being recommended to use," he added. 'Exceptionally busy' The Northern Line, the busiest of the Tube network, is being upgraded with a new signalling system and replacement tracks. 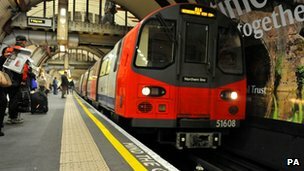 TfL says it will increase the line's capacity to take an extra 11,000 people per hour when work is completed next year. Gareth Powell, TfL's director of strategy and service development, said: "During the 2012 Games many of our passengers made small changes to their journeys which meant we were able to carry record numbers without the transport network feeling any busier. TfL also wants to extend the Northern Line to Nine Elms and Battersea. A public inquiry to consider the proposal starts on 19 November. Meanwhile above ground the fleet of buses that operate out of Stagecoach East London's Barking Garage, now run on bio-diesel.